What to Do If Bad Weather is Invevitable! Mother Nature does not always cooperate when planning big outdoor events, and kids' carnivals & family festivals are no exception! As an example, this past fall central Texas had one of the wettest months on record. Here are a few quick tips for dealing with rainy weather when trying to plan a big outdoor event! 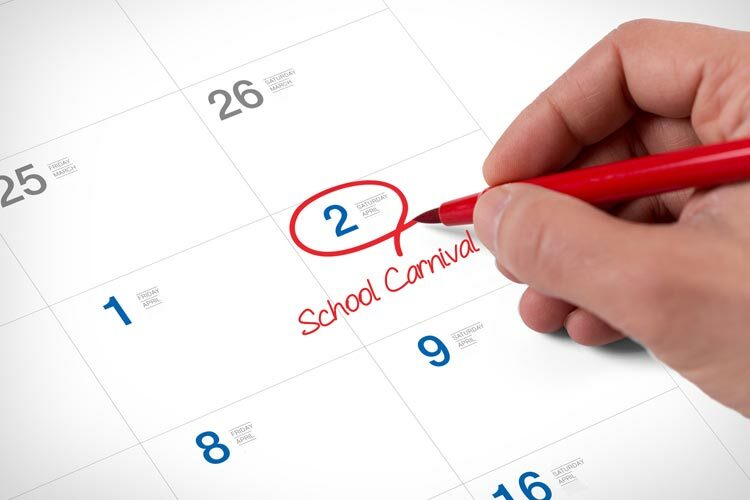 Maybe your first thought is to cancel your fall festival or school fundraising carnival. This may not be necessary! After all, when the weather is unfavorable, other outdoor events (like kids' outdoor sports games and practices) may be cancelled too - so families welcome a chance to have something for kids to do and a fun way to "burn off some extra energy" instead of being cooped up at home! 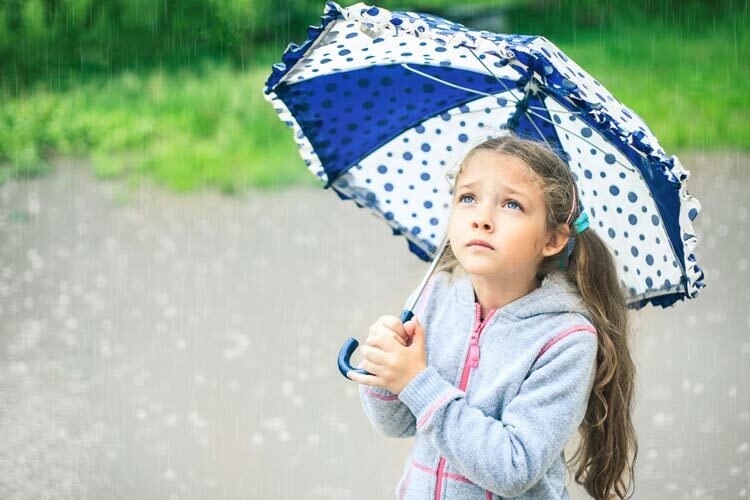 Check out our quick tips for dealing with rainy weather below! Most carnivals and festivals are held outdoors. The fresh air, sunshine and kids dashing from game to game are just part of a carnival or festival. Sometimes it is difficult to envision holding your event indoors instead of outside. Remember, just because you cannot have your trampoline jumping set for the kids does not mean your entire event is OVER! Start thinking about the possibilities of moving things inside. 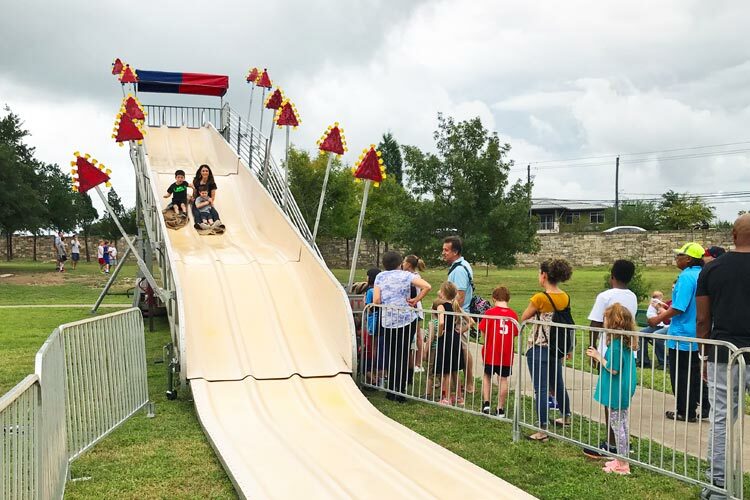 Of course,there will always be activities that cannot be moved indoors like a petting zoo, large rock wall, metal slide, and the dunking booth to name a few. But remember, just because you cannot have some of your "big activities" for the kids it does not mean you must cancel all the fun! This is analogous to canceling an entire kids' birthday party because you didn't get a birthday cake. There would still be pinata, plenty of games, socialization, treat bags, and presents for the kids to enjoy! 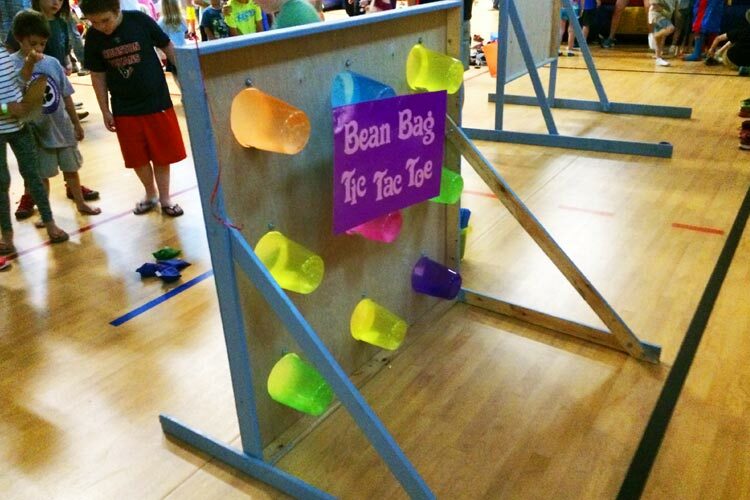 The above image is an example of a Bean Bag Toss Game (one of about 10 indoor games) inside an elementary school gym during stormy weather. First, think of your space. If your event is at an elementary school, generally you can get permission for use of the gym and cafeteria. In addition, we have seen main hallways used some for games as well! It is common for schools set up their cake walk booth indoors rain or shine just so the cakes don't melt in the sun. But, you will be surprised how many carnival games and activities can be moved indoors without really much change! For example, the 2 Liter Ring Toss game, Crazy Hats game, Can Knock Down game, Lollipop Tree, the Grab Bag game, and so many more games do great indoors or outside too! 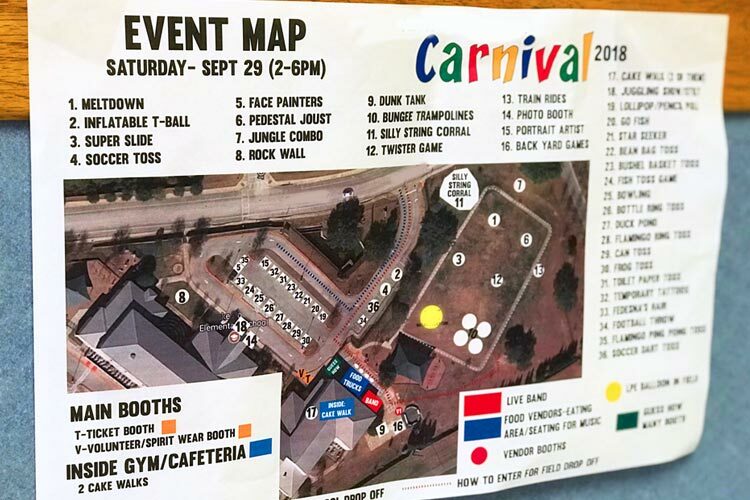 Example of a school carnival map at an Elementary School Fundraising Carnival. Start by making a list of games that can be indoors and a rough map to show where you will place different activities! The map shown above was from an event that had some unpredictable weather. The carnival ended up having some lightning threats for a while so they shut down the outside games and had folks go indoors. Kids and their families were able to enjoy the cake walk, the silent auction, and other fun games until the bad weather passed and they could enjoy time outside once again. Before your event, it is a great idea to find out what your vendors will do if the weather is bad. For example, if you have outdoor inflatables, gusty wind will prevent them from being used. So talk to each carnival provider to find out what the cancellation policy is so you know when you must cancel to prevent against losing money from your deposits. This school Friday Family Fun Night kept the fun rolling! 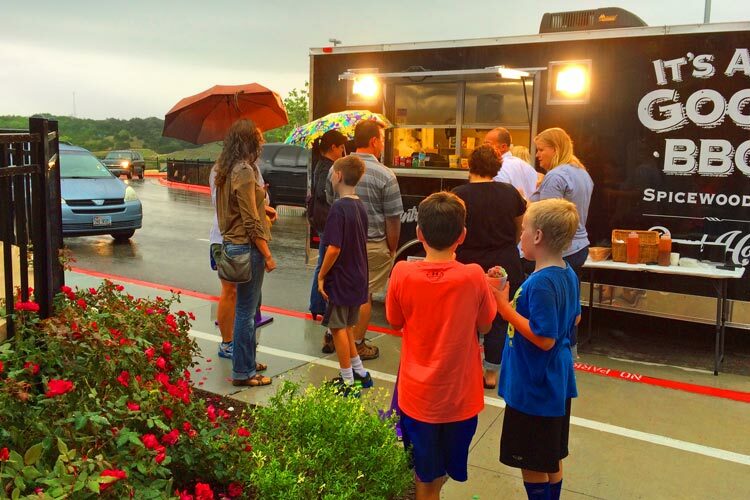 Food truck favorites were sold outdoors and families ate inside the school cafeteria. Will Folks Really Melt From a Few Raindrops? Even with all the technology we have, sometimes it is difficult to tell exactly what the weather will do. This carnival kept the fun going even through the skies were gray! One benefit to the overcast skies is that especially for the warmer climates, the shade from the clouds make the event cooler! The folks in the picture above were enjoying mild weather without scorching sun for their fall festival! IMPORTANT: Lightning is a safety issue! A few raindrops will not shut down an outside festival - but lightning is another issue altogether! If you choose to have some events running outside with rain clouds looming overhead, have someone in charge of checking for lightning approaching the area frequently! Many smartphones have apps to alert you of lightning in the area which may also be of assistance. If lightning is within 15 miles you must shut down outside booths and ask folks to take cover inside until the lightning threat is gone. For more information on staying safe when lightning is a threat and more outdoor safety tips, please click here for a downloadable PDF from NOAA from www.weather.gov. So you had a picture in your mind of the perfect cloudless day - wall to wall sunshine and it just is not happening this year. That's okay! 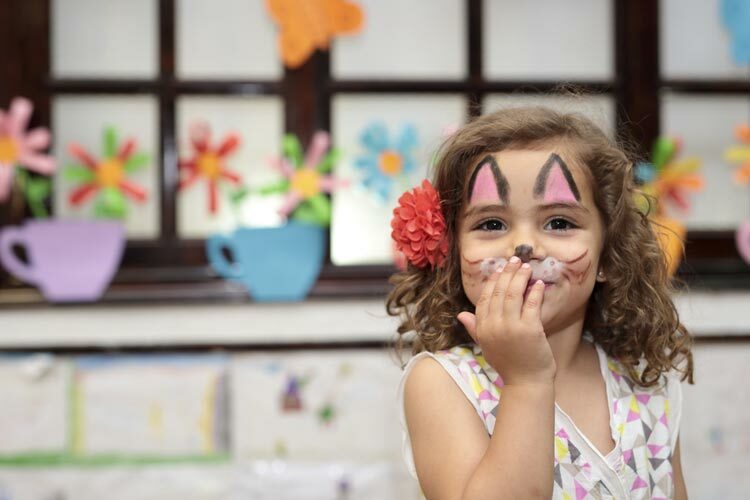 This year you can add some new indoor activities and remember that parents will love to have something fun to do outside of the house so they do not "go stir-crazy!" Don't forget there are a whole host of activities that can be done inside. Face painting and even Sand Art if set up on a table on a tile floor (not recommended for a school gym) are great indoor activities! Looking for some new indoor game ideas? We are guessing you have already seen our Free Game Ideas webpage - but if not check it out you are sure to find something new that can easily be moved indoors. If you are not sure then just give our team a call during business hours, we will be happy to make some recommendations! This is our least favorite option for fun fairs with anticipated poor weather. Why? Well, primarily because so many folks have "saved the date" including carnival chairmen & chairwomen, food & activity vendors, volunteers (including parents, teens, and local businesses), and not to mention the kids who have been looking forward to the carnival - and now it is cancelled. The biggest issue is that it is so very difficult to get the commitments of all the mentioned above folks for another weekend. Sometimes "later" really means "never" and this can be the case with carnivals, festivals and more. One way the pushed back date is a great idea is for BIG weather events that make it unsafe to have your carnival - for example a hurricane, flooding, blizzard, or other weather-related events that shut down the town. In that case, there is no better idea than to reschedule - but make sure you do that SOON after the event is posted or you will run out of weekends quickly! We hope this blogpost has helped you to be better prepared for any weather that is coming your way on the day of your big event! We have more hints and tips below for all kinds of carnival and festival assistance and it's free! 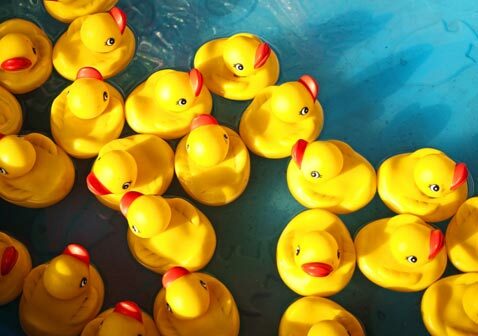 We at Carnival Savers are wishing you all the best with your big upcoming event!